Where do we get the Bible from? Dr. Reagan: Back in the "Dark Ages" when I was a kid during the late 1930's and 1940's, I grew up in a nation where the majority of people were professing Christians. We read the Bible in school, we used it in fact in English classes, and we prayed in school. Most people went to church. But, things have drastically changed since then. We now live in a secular nation that seems to have little familiarity with the Word of God. 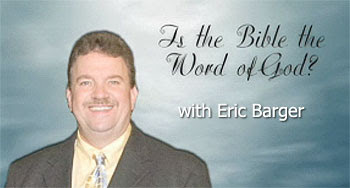 Eric Barger: Let's begin by shattering a common misconception, one that the secularist would use in trying to argue with us that the Bible is just merely one book. The Bible is in actuality 66 different books neatly put together into one binding that we conveniently have as one book today. This compilation of these books into the Bible was written by forty different authors over about a 1,500 year period in its production. We can see the supernatural handprint of God on it as it harmonizes so perfectly together. So, when I quote Isaiah to prove Jesus, or when I quote Jesus to talk about Moses, I am not quoting the same source as secularists would immediately claim in saying that we are using the fallacy of circular reasoning. It's not circular reasoning. The Bible is unique and it is the only book in the world of its sort. In fact, as I said, it is 66 unique different books written in three different languages over 1,500 years: Aramaic, Greek and Hebrew. And yet, it all fits together to create one theme. This unity shows the handprint of God as He came upon men to write His thoughts down in His desire for us to understand. The Bible deals with all different kinds of words. It's got the words of angels, the words of demons, the words of Jesus, and even the words of Lucifer. As God's Word it gives us the account of the Jews in the Old Testament as well as it gives us a basis for the Church in the New Testament. Without the Old the New falls apart, and without the New the Old falls apart. Jesus validated the Old Testament by quoting 24 different books from the Old Testament. The egghead theologians out there try to tear apart the Bible by saying it has errors all throughout it, or that it's just not that reliable, or that it's a nice idea but it's not really the Word of God. Now, if Jesus was the perfect God-man and was God incarnate and He came here and He quoted something from the Old Testament, you would have thought He would have brought correction to it instead of corroboration if He thought it was recorded incorrectly. Dr. Reagan: Who put the Bible together? The 66 books that were put together into what we now have as the Bible came about in some way. Eric Barger: The Early Church just didn't one day decide to go to Starbucks to get a coffee, choose whatever books, and declare in that one day, "Well, I think we've got it now." Actually, the Old Testament had already been put together by the Jews, so that part was already done. Now, for the New Testament, during the First Century of Christianity there wasn't a standardized set of teachings that the Church taught from. Pastor A over here may of only had a couple of Paul's letters that he trusted. And, Pastor B, he maybe had the books of Acts and Matthew. Pastor C had something else. But, they didn't have a standardized set of teachings. It wasn't really until about 140 AD due to a cult leader named Marcion that the Church felt really compelled to collect all the New Testament teachings because there were so many thousands of people who had gotten confused and were following Marcion's cultic ideas. Marcion believed the God of the Old Testament was different than the God of the New, and so they needed a standardized set of teachings that would refute not only Marcion but many of the cultic, Gnostic ideas that were out in those days. That's what really catapulted them into putting together the first Canon. Their criterion for selection was interesting. Now understand, there were 12 Gospels and over 50 different letters or epistles out there, but very few of them made it into the New Testament as we know it. Only four gospels and a handful of letters qualified. The number one criteria that the Church used in those days was this question: Did the teaching in these letters match the oral teaching of the Apostles? Did it match what the Apostles taught their disciples and their disciples taught their disciples? In those early days they heard and they learned what the Church believed orally. They heard a teaching, and if a letter didn't match like for example the Gospel of Thomas, then it didn't make the cut. Dr. Reagan: I am sure you are aware of the fact that one of the major attacks on the Bible today is the attack that all these deciding councils were political and the people who just happened to have the political power selected the books. Detractors say there were other books that should have been selected like the Gospel of Thomas. They'll claim they were certainly canonical and should have been added in. It's just who was on the winning political side to them. Eric Barger: Sure, there was the Gospel of Thomas, the Gospel of Jude, the Gospel of Mary Magdalene and so many others, but they didn't match the teaching of the apostles like Matthew, Mark, Luke and John did so well. Dr. Reagan: In fact, when you read those you sense immediately they don't match up. Nathan Jones: Mary's Gospel even tells you that you have to tithe to get into Heaven. Eric Barger: Yes. These other gospels and other epistles also didn't make it into the Bible because they held things that were not true historically, but in particular they weren't true in harmonizing with the oral teaching of the apostles. Nathan Jones: Wasn't the Gospel of Thomas actually written 200 and some years after Thomas? Even the book of Enoch showed up as late as the 1700's. Eric Barger: Yes, the Apostle Thomas could not have written the Gospel of Thomas. It was a common practice by some unethical people to attach the name of somebody from Christian history to gain notoriety for their false teachings. The criteria of authorship is exactly why the book of Hebrews was one of the last books added to the New Testament, because no one was quite sure who wrote it. I personally believe that Paul wrote it, but I won't break fellowship with somebody who disagrees with me on that. We may not know who wrote it for sure, but it matches theologically with the teachings the apostles taught orally along with the first person accounts of the four Gospels. In the next part of this series on the validity of the Bible, we'll ask Eric how we can know that the Bible we have today is true to the original manuscripts. Very interesting. I don't think I have ever hear all of the history on this before... knew it was 66 different books, but how they were chosen is very intriguing. From what I have read on the subject of who wrote Hebrews; it does have the style and rhythm of Paul and the greetings are typical of Pauls. It doesn’t take much detective work to recognise another persons ‘fingerprint’; not so much by WHAT is being written about, but rather the WAY each author expresses themselves is a dead giveaway. Paul was well trained in the O.T. Scripture, just as the anonymous author of Hebrews was. So I agree with Eric; but like him, I wouldn’t quarrel over it as ultimately The Mind of Christ was behind each statement. Really, the Gnostics revealed themselves as fakes, as God’s ‘fingerprint’ was conspicuous by its absence in their WHAT as well as their WAY. It is a fascinating study and can’t help but bring a blessing to you, and Praise to The Lord at the miracle of consistency over so long and by so many ‘secretaries’ raised up by The Author. Correction to my former comment. The distinguishing ‘mark’ of Paul is not, as I stated before, in the greeting rather it is in the salutation style which involves the word ‘Grace’. My understanding, to a large part, comes from Chuck Missler’s Commentary on Hebrews. Listening again I am personally convinced Hebrews was written by Paul. There are several interesting reasons why and one includes Josephus quoting Clement of Alexandria who categorically stated that Hebrews was written by Paul in the language of the Hebrews and Luke translated it into Greek for the Greeks. To discredit all the Gnostic books using your reasoning, we would also have to discredit Mathew, Mark and Luke. The Catholic Church has admitted that none of those books are named after their authors...and in fact, it is the Catholic Church that decided which books would become the Bible as a whole. Why beat around the bush? What is the Apocratha & why did the catholic church add it ? ? ? Should it be disregarded & why ? ? ? Sorry for my misspelling . . .
the correct spelling is . . . Apocrypha. Looking forward to a response to my earlier questions.